NOW A MAJOR MOTION PICTURE, Directed by David Cronenberg and starring Keira Knightly, Viggo Mortensen, Michael Fassbender, and Vincent Cassel. In 1907, Sigmund Freud and Carl Jung began what promised to be both a momentous collaboration and the deepest friendship of each man’s life. Six years later they were bitter antagonists, locked in a savage struggle that was as much personal and emotional as it was theoretical and professional. 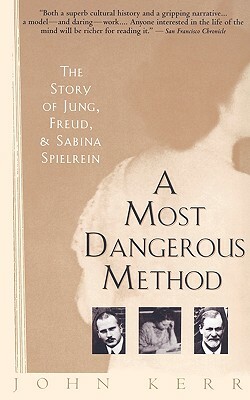 Between them stood a young woman named Sabina Spielrein, who had been both patient and lover to Jung and colleague and confidante to Freud before going on to become an innovative psychoanalyst herself. With the narrative power and emotional impact of great tragedy, A Dangerous Method is impossible to put down. John Kerr (1950–2016) is best known for writing A Most Dangerous Method, a book that became the basis for a play and a movie. Kerr was trained as a clinical psychologist at New York University. He was an editor at The Analytic Press, a scholarly press specializing in works on psychoanalysis, and was coeditor and a contributor to Freud and the History of Psychoanalysis. He died in Portland, Maine at age 66.